The long and uninterrupted evolution and the wide spectrum of environments spanning large temperature and moisture gradients precondition a unique pedological and ecological diversity in the Caucasus. Dolukhanov's (1966) reconstruction of the historical biogeography of the Caucasus points to the importance of three major factors determining the course of evolution: its connection with both Eurasia and Gondwanaland, changes in topography (especially mountain-building), and changes in climate. The history of vegetation dates back to the Paleogene. In the Eocene, tropical vegetation, dominated by palms and ferns, prevailed in the Caucasus while cold-resistant boreal species penetrated into the region forming the Turgai flora in the Oligocene. The Oligocene vegetation was formed by a mixture of tropical and boreal species (including Picea, Abies, and Betula) and already at this early stage of evolution, altitudinal zonation existed. When the closure of the Tethys Ocean in the Miocene created new opportunities for the migration of species, xerophilous species of Gondwanaland origin, spread into the region. Open xerophilous vegetation first became prominent in the upper Miocene as continentality of climate increased following the formation of the land mass and the mountains. Sparse arid woodlands, which succeeded subtropical savannahs, are believed to be the most ancient xerophilous communities in the Caucasus. During the Sarmatian, subtropical forests with the widespread participation of evergreen species developed in the Caucasus. By the Kimmerian, forests containing subtropical and tropical communities (in particular laurel forests) had evolved but as climate deteriorated, tropical and subtropical species were largely replaced by deciduous temperate species. While across most of the region temperate communities evolved as both continentality of climate and absolute elevations were increasing, tropical vegetation survived in isolated refugia. A tropical refugium existed in the Colchis region where milder conditions, typical of the Miocene, continued until the middle Pliocene. The progressive build-up of the mountains isolated the Colchis region from the rest of the Caucasus, creating a milder climate and while more cold-resistant species, evolving in the highlands, penetrated in the region and became dominant in the late Pliocene, some heat-loving species survived. The relict species found in the Colchis refugium at present include Vaccinium arctostaphylos, Viburnum orientale, Rhododendron ponticum, Ilex colchica, Quercus pontica, Corulus colchica, Lauras officinalis, Rhamnus imeretina, Hedera colchica, and many other species. Relict forest communities occur mainly in the foothills and lower mountains reaching an altitude of 600-800 m where temperatures are sufficiently high. They are very different from temperate forests, resembling tropical rainforests in many ways: the Colchis forests have a multitier structure and contain a variety of woody vines; the regeneration in the lower tree tiers and undergrowth is slow because of the lack of light; under the condition of warm and humid climate, dead plant mass, which is abundant in autumn, decomposes quickly and there is little litter; mosses, ferns, and occasionally shrubs develop on trunks and branches of trees (Gulisashvili et al, 1975). 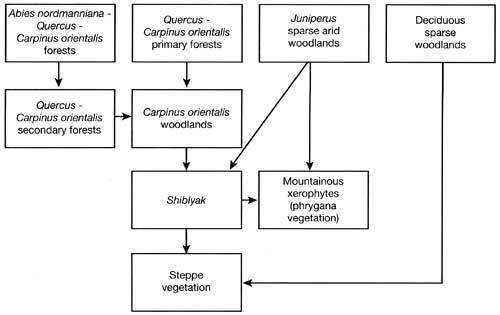 They are polydominant communities comprising thirty woody species. These include: various species of oak (Quercus hartwissiana, Q. iberica, Q. imeretina), elm (Ulmus sarbata, U. carpinifolia, U. elliptica), lime (Mia platyphyllos, T. multiflora), Alnus barbata, Carpinus caucasica, Castanea saliva, Taxus baccata, Ficus cokhica, Diospyros lotus, Pterocarya pterocarpa, Pyrus caucasica, and others. Another refugium existed in the Talysh mountains where the so-called Hyrcanian flora have survived. Many species are found both in the Colchis foothills and in the Talysh which exhibits connections with the Mediterranean and Asia Minor. However, the Hyrcanian refugium is located 4.5° further south than that of the Colchis and many species, not represented in the Colchis refugium today, have survived in the more favourable climate of the Talysh. A restricting factor in the Talysh is ber aridity and moisture-loving species had a better chance of survival in the Colchis refugium. Similarly to the Colchis region, relict forests develop in the lower mountains of the Talysh while individual relict plants can be found at an altitude of 1000-1200 m. Both polydominant and monodominant forests occur. The most remarkable relict of the Tertiary age, typical of the Hyrcanian flora, is Persian ironwood (Parrotia persica) which is found only in the Talysh and northern Iran. Stands, dominated by Parrotia persica, used to grow on the marine terraces of the Lenkoran lowland but at present these are only preserved in nature reserves. In the foothills, Parrotia persica forests do not form a continuous belt but occur as individual groupings while between 200 m and 800 m Parrotia persica occurs as an admixture to oak and hornbeam forests. The Talysh is the only area within the FSU where another relict, Albizia julibrissin, is found in the wild. It is also the only region in the Caucasus where such relicts as Diosperus lotus, Acer velutinum, and Zelkova carpinifolia occur as a forest-forming species. Much of the polydominant relict forests have been destroyed and survive at present as small stands in the lower mountains. Better preserved are the typical Talysh polydominant (so-called Hyrcanian) forests. The tree tier in the Hyrcanian forests is formed by the above-mentioned relicts and also by Quercus cas-taneifolia, Zelkova hyrcana, Ficus hyrcana and on the plains by Ulmus carpinifolia, Populus hyrcana, and Alnus barbata. The formation of the Greater Caucasus created a barrier preventing the exchange between boreal and subtropical regions. Having migrated to Transcaucasia before the formation of the Greater Caucasus, many species continued to evolve in isolation. The break in connection is clearly reflected in the occurrence of different woody species (e.g., different species of oak) northwards and southwards of the Glavny Ridge. The history of biota in high mountains is still poorly known. Perhaps the two most striking features of the high mountainous vegetation are the low participation of arctic species and the enrichment with Tertiary species. Although the Greater Caucasus was glaciated in the Quaternary, glaciers were of mountainous valley type and never merged with the ice covering the East European plain. Arctic species spread in front of the advancing ice and, because the ice sheet and even periglacial zone never reached the Caucasus, there are few arctic and periglacial species in the region. Many refugia existed, especially on the southern macroslope of the Greater Caucasus, where ancient species survived. Thus, more than forty Tertiary suptropical plant species are found on the southern macroslope and there are also many mollusc and insect species (Gulisashvili, 1964). The cold climates of the Pleistocene had two main effects on the vegetation: xerophilous species became more prominent in Transcaucasia (especially in its southern and central parts) while in other regions (particularly in the Northern Caucasus) vegetation became depauperate and the Pliocene forest formations became fragmented or extinct. The extinction of the forests occurred in the lower mountains which experienced frequent advec-tion of cold air from the north-east in winter as a result of the establishment of the semi-permanent high pressure over Asia. In the middle mountains, where abundant winter snow provided insulation, relict vegetation survived locally. The coldest epochs were marked by the development of Pinus, Abies, and Abies-Picea forests in the Greater Caucasus. In the foothills, coniferous forests were succeeded by Pinus-Betula forest-steppe while dwarf birch and pine occurred above the timber line. In the Lesser Caucasus and Transcaucasia, the development of dark coniferous forests was more limited especially in the east where broad-leaved deciduous forests dominated. However, in the Lesser Caucasus, Abies and Picea forests spread as far south-east as the Murovdag Ridge while pollen of Picea and Pinus, dated to the latest glacial maximum, indicates that these forests occurred on the shores of Lake Sevan. The subsequent amelioration of climate caused the retreat of coniferous forests westwards and northwards to their modern areas of distribution as broad-leaved deciduous and Pinus forests developed in their place. Although geologically the Caucasus is one of the youngest regions of Eurasia, its biota has a long history. The contemporary patterns of vegetation have developed under the influence of many factors: the closure of the Tethys Ocean allowed the migration of species; the formation of the mountains provided diversity of habitats and isolation; complex topography resulted in the formation of refugia in which ancient species survived the Pleistocene deterioration of climate. In contrast to the rest of Eurasia, the biota of the Caucasus is species-rich and has a high level of endemism. There are 6350 plant species in the Caucasus of which 1600 are endemic. The Caucasus had much more favourable Pleistocene and early Holocene climates and environments than most of Eurasia and the region appears to have one of the longest histories of human habitation in Eurasia, extending from the early and middle Pleistocene (Praslov, 1968; Lyubin, 1970). Already at the start of the 6th millennium вс, agricultural settlements existed in Transcaucasia (Kushnareva and Chubiashvili, 1970; Lisitsyna and Prishchepenko, 1971; Dolukhanov and Khotinsky, 1984). The economy of these settlements was based on the cultivation of wheat, barley, oats, millet, and vegetables and on stock breeding. The Caucasus and Transcaucasia became one of the centres of ancient plant cultivation in Eurasia and the alteration of the natural environment by humans occurred here at a very early stage. The expansion of agriculture was accompanied by deforestation, development of irrigation, and amelioration in the broad-leaved zone. Pastoralism, which replaced arable agriculture in many regions during the 3rd millennium вс because of the aridization of climate, had an impact on the open ecosystems. Humans have been potent agents of environmental change for centuries and long histories of human impact have led to the profound alteration of soil cover, vegetation, and wildlife on a vast geographical scale. Many vegetation communities, seen as natural today, are in fact secondary successions formed over centuries of human activity. Examples of such alterations include the steppes of the Akhalkalak highland (previously forested), the Garedzhy Steppe (previously occupied by sparse arid woodlands), the steppes and meadow steppes of Armenia (previously occupied by sparse arid woodlands and oak forests), xerophilous vegetation which succeeded sparse arid woodlands in many regions, particularly in Armenia and Dagestan, and ubiquitous shyblyak — a dense thicket of bushes and shrubs. A typical model of human-induced vegetation succession is shown in Figure 15.3. Fig. 15.3 Model of the formation of secondary vegetation in eastern Georgia. After Gulisashvili et al. (1975).